Home BUSINESS MTAANI NEWS Protests by Mukiriti traders culminate to hawkers being cleared of Thika streets. Protests by Mukiriti traders culminate to hawkers being cleared of Thika streets. Kiambu Governor Ferdinand Waititu (in blue) trying to calm down irate small-scale traders from Thika town who were protesting the invasion of mama Ngina Garden by hawkers presumed to be from other regions. There was a standoff in Thika town as hawkers trading in Mukiriti Market protested the invasion of Mama Ngina Garden by their counterparts from other sub-counties. Business was paralysed for over three hours as they marched around the town streets chanting slogans against what they termed as intrusion by Murang’a and Githurai hawkers. It is alleged that some known local leaders hived a scheme on Sunday night to subdivide the garden. It is said that the exercise was done in secrecy where only a few people knew about it. “These people planned this allocation on Saturday and was executed yesterday (Sunday) night. Most of the spaces ended up being awarded to hawkers from Githurai and Murang’a, having bribed their way into the garden,” said an agitated trader. He wondered how the planners of this ‘illegal allocation’ could overlook Thika traders and give priority to ‘foreigners’ who basically could get the same privileges from where they came from. The traders vowed to object any move by Kiambu County government to disrupt their operations. “As traders in Mukiriti market, we feel disappointed by this move. This is an indirect way of driving us out of business. How do you expect customers to come to us while there is an alternative in town? It is either they allocate spaces to all of us or everyone goes to where they have been trading from before,” another trader pointed out. Mama Ngina garden is a public utility meant for recreation but has been unoccupied over the years. 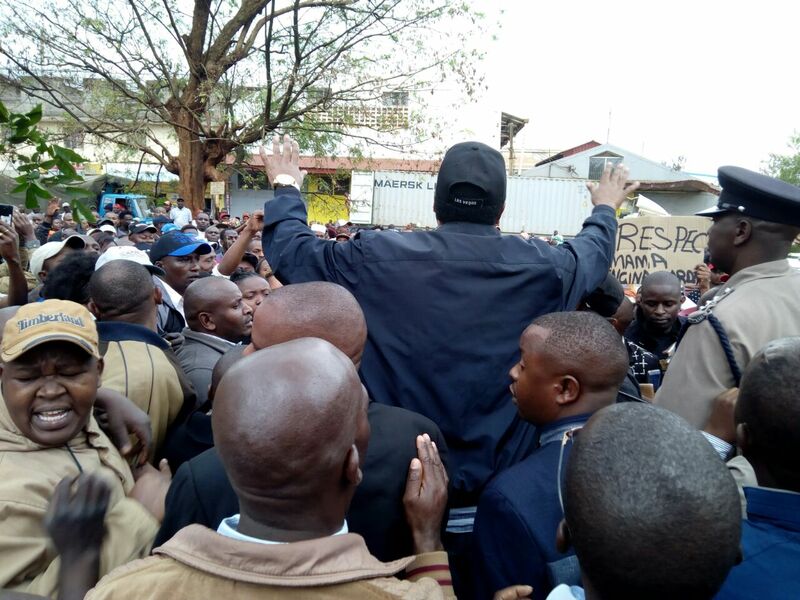 The stalemate prompted Kiambu Governor Ferdinand Waititu to come and address the situation. The governor had a rough time cooling down their tempers but after all was calm, Waititu ordered all hawkers to peacefully clear from the CBD including all those selling their wares along the streets. “We cannot have hawkers all over the place. I am humbly asking all of you to relocate back to where each one of you was operating from before the campaign period. Otherwise, we are making arrangements to get an alternative location for you soon. We need to restore sanity in the town and respect other people’s businesses too,” said Waititu. The governor promised to collect the data of all hawkers operating in Thika town in a weeks’ time and issue them with identification cards. This way, he added, the county government will be in a position to wade off impostors and bring order to this sector. There has been hue and cry from the business community and residents of the town over the manner these hawkers had invaded the town, making it very difficult to work or do anything within the CBD. The move to evict them from the doorsteps of shops and the streets will come as a relief to a majority of the people of Thika.